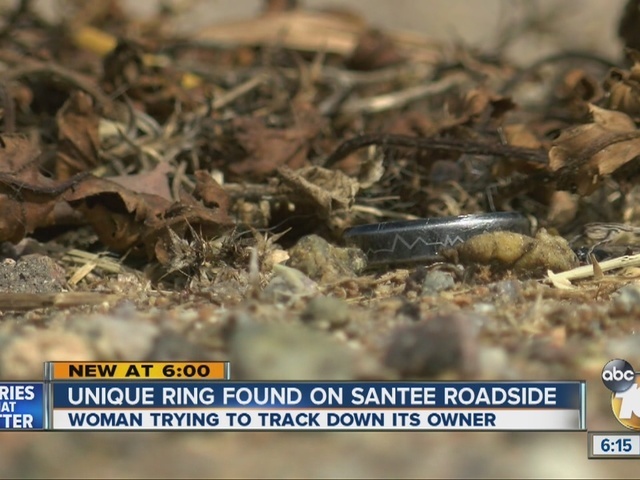 A Santee woman needs help finding the owner of a ring she found while walking home alongside Woodside Avenue. Adrianna Hendrickson found a man's ring in the dirt this weekend, and she said, "I thought it was just a bottle cap from a soda." The titanium ring has a few hearts and an EKG pattern on the outside. "It looks like it belongs to a nurse," said Hendrickson. "I want to make sure that they get it back." She put it on social media, including the East County Emergency Updates Facebook page . "I thought it was valuable," she explained after she called several jewelry stores. The ring is only worth about a $100, but Hendrickson said the sentimental value could be worth more. All she wants is to find the rightful owner. "I don't want a reward. I want them to get their sentimental value, that means a lot to their heart," she said. She wouldn't show 10News the inside of the ring because she wants the rightful owner to describe it before she hands it over.